We’d love your help. Let us know what’s wrong with this preview of The Hostage of Glenorchy by Kristin Gleeson. After overhearing a plot to kill Mary Queen of Scots, Abby Gordon is sent from Paris to the Laird of Glenorchy's home at Kilchurn Castle for safety. Disguised as a boy, she becomes a lute player among the household musicians where she encounters the laird's hostage, the attractive Iain MacGregor, a pawn in the laird's struggle for power in Scotland's turbulent politics. But is Iain really a hostage to fortune or is he playing his own dangerous game? As Abby's feelings intensify for this Glenorchy hostage she is caught in the web of intrigue that permeates the household and is drawn deeper and deeper into danger. With spice, wit and action packed plotting, Kristin Gleeson's Highland Ballad Series is as compelling as Diana Gabaldon's Outlander novels. To ask other readers questions about The Hostage of Glenorchy, please sign up. I’m a great fan of Kristin Gleeson’s work, in particular the way she effortlessly combines the culture, customs and language of the period with highly entertaining historical adventures. The Hostage of Glenorchy is no exception. In this vibrant tale, we follow Abby a talented young lute player, as she flees 16th century Paris disguised as a boy, and embarks on a journey of intrigue, spiced by scheming, politics, danger and romance. With knowledge of a plot to assassinate Mary Queen of Scots, will I’m a great fan of Kristin Gleeson’s work, in particular the way she effortlessly combines the culture, customs and language of the period with highly entertaining historical adventures. The Hostage of Glenorchy is no exception. In this vibrant tale, we follow Abby a talented young lute player, as she flees 16th century Paris disguised as a boy, and embarks on a journey of intrigue, spiced by scheming, politics, danger and romance. With knowledge of a plot to assassinate Mary Queen of Scots, will Abby’s skill as a musician save her from peril or will she find herself immersed in yet more skulduggery? As usual for this author, the story evolves at a cracking pace, and the Scottish setting and assorted characters combine to make this first book in a new series quite addictive. Abby and Iain, the hostage of the story, are a couple both at odds and at one with each other and I’m definitely looking forward to their continuing adventures. A recommended read for all fans of Scottish Historical Fiction. This review has been hidden because it contains spoilers. To view it, click here. I found the start of the book rather confusing at times - there is no real explanation as to why Abby would decide to pretend to be a boy, and no explanation as to how she is so miraculously transported to Scotland when her father only decided that morning that she was going to leave. I liked the writing but the story dragged with not much real tension or conflict - the 'plot' at the start seemed to fade away into insignificance, and the 'plot' with Iain as hostage was never really developed to I found the start of the book rather confusing at times - there is no real explanation as to why Abby would decide to pretend to be a boy, and no explanation as to how she is so miraculously transported to Scotland when her father only decided that morning that she was going to leave. Right off the hop, the title does not aptly represent the content of the book. Only a few sentences were said about the hostage, and how he came to be at Castle Kilchurn - the rest of the story concentrated on Abby who disguised herself as a boy. An easy read, which in turn allowed the reader to get engrossed in the story and wonder what in the world the young "lad" is going to get into next! It was fast paced and full of mystery, intrigue, murder and of course what novel would be complete witho Right off the hop, the title does not aptly represent the content of the book. Only a few sentences were said about the hostage, and how he came to be at Castle Kilchurn - the rest of the story concentrated on Abby who disguised herself as a boy. An easy read, which in turn allowed the reader to get engrossed in the story and wonder what in the world the young "lad" is going to get into next! It was fast paced and full of mystery, intrigue, murder and of course what novel would be complete without a bit of romance? Literally minutes after her true identity is revealed, she is having romantic thoughts about the hostage, where none had existed before. Having said that, I found the story line very difficult to follow - they were all over the castle, in each other's chambers, in the stables, and neighboring farms. Had a hard time placing characters and determining their significance to the story. On the plus side, being of Scottish descent I enjoyed the way the author incorporated Scottish history into the book. Like so many others have said, the way the "book" ended so abruptly was highly disappointing - not even a cliff hanger - you expect to turn the page and see what happens to her. BUT.. thanks to KINDLE I was able to pick up the 2nd book in the series for less than $1.00 and continue reading immediately. Hopefully the Mists of Glen Strae will provide a little more detail and closure. ***WARNING*** This is not a stand-alone book! An interesting story with several well-drawn characters but an abrupt, unsatisfactory ending. This is the first book in a series so perhaps issues will be resolved in book two. Gabrielle "Abby" Gordon is sent from Paris to Kilchurn Castle in Scotland for safety and to serve as a companion to the ailing wife of the laird. All she wants is play her lute but knows that a woman can never be considered as a musician so she disguises herself as a young man. ***WARNING*** This is not a stand-alone book! An interesting story with several well-drawn characters but an abrupt, unsatisfactory ending. This is the first book in a series so perhaps issues will be resolved in book two. Gabrielle "Abby" Gordon is sent from Paris to Kilchurn Castle in Scotland for safety and to serve as a companion to the ailing wife of the laird. All she wants is play her lute but knows that a woman can never be considered as a musician so she disguises herself as a young man. Things go down hill from there -- a hostage, a sad bride-to-be, a suspicious death, and a firebrand reformer who accuses Abby of being a witch. I really wanted to like this as I love middle ages, especially UK settings but I just couldn't get into it. I didn't think the character development was there and though the storyline was ok, it wasn't really unique or anything. It just seemed flat. Your basic girl pretends to be a boy story. I included it in Historical-fiction category because actual historical figures are in the story but I think the actual story is totally made-up. I don't think I can really add anything to the synopsis alre I really wanted to like this as I love middle ages, especially UK settings but I just couldn't get into it. I didn't think the character development was there and though the storyline was ok, it wasn't really unique or anything. It just seemed flat. Your basic girl pretends to be a boy story. I included it in Historical-fiction category because actual historical figures are in the story but I think the actual story is totally made-up. I don't think I can really add anything to the synopsis already published but will just say I found myself skipping and not really feeling like I was missing anything. This book is the first in a series so ends on a bit of a cliff but I actually have no desire to read anymore, which is not usually the case when I enjoy the story. One of the few ! Worth it's stars for being one of the few Scottish spin offs that is peopled by could have been of their time and are not mearly adopting a phony accent and wearing fancy dress. There is more atmosphere here and the historical setting and references make sense , a nice change from the often placing "Some where in the Highlands" at "Sometime in the past "
I enjoyed being where I was and when so much that the quite frothy story line had me several chapters into book two before writin One of the few ! I enjoyed being where I was and when so much that the quite frothy story line had me several chapters into book two before writing this opinion. Not profound but well done and enjoyable. The story goes on with some interesting events. Then it abruptly ends with no explanation of the mysteries contained within the events. Of course, the reader is referred to the next installment. The best part is not in the book itself, but in the historical summary in the ending notes. These are not woven into the book. I hate it when author's employ such ploys to get readers for subsequent books! I knew when I started this book it was part of a series, obviously. Still, I expected it to do something -- to tell a complete story in itself. Instead, I was left at the end wondering not only "what's next" but "what?" The narrative simply stopped. It was not strong enough to make me want to read further. Perhaps if Book 2 came available on one of the free sites, but even then it's only a maybe. Feisty, musically gifted young woman ahead of her time, over hears a plot to poison Mary Queen of Scotts. She leaves the French court in disguise and finds herself jumping from the frying pan into the fire stuck in a feud between rival Scottish clans. Plenty of adventure, beautiful music and a little romance. This was a pretty enjoyable historical fiction book. Abby, the female protagonist dresses as a young man in the early part of the book, which isn't terribly uncommon in these sorts of books. I've read enough gender benders to wonder how the woman/girl pulls this off so easily. So many don't address a couple aspects that would be important but at least one issue is addressed here. Quite often I have read books that made me want to read another book by that author. This is not that case, in this book I was left right at a critical point in the plot and it just ended. I don't know how to handle that. It was a good story until it just abruptly ended. I thoroughly enjoyed this historical Scottish book. It had great imagery, plot, and characters. I’m anxious to read the rest of the series as this book ended with a cliff hanger and I don’t really enjoy abrupt endings to books. There were some grammatical errors as well so instead of five stars, I gave it four. Who was truly the hostage? This book has so many twist and turns that your head is confused as to what is truly going on in the story. What is Gabriel's true aim? Does she merely want the opportunity to play her instrument, or is there more to gain? Abby is sent to Laird Campbell's to keep her safe after she over hears a plot to kill Queen Mary of Scotland. She's supposed to go to be a companion to the lairds wife but Abby has other ideas and poise s as a young lad and that's when trouble finds Abby. I would give this book a 4 if it were indeed a whole book. These book series hook you with a cliff hanger after a mere 270 pages. The Author did a great job, it was an interesting historical romance. I love historical mysteries and this one kept me engaged from page one. Great character development and plot line. I can't wait to read the next in the series. It was an interesting read. But it hardly should have been called an ending. The end of the chapter, maybe. But this is apparently a longer book than she could put in one book, so she just chopped it off, left it dangling. Guess I'll still give her a 5 star tho. 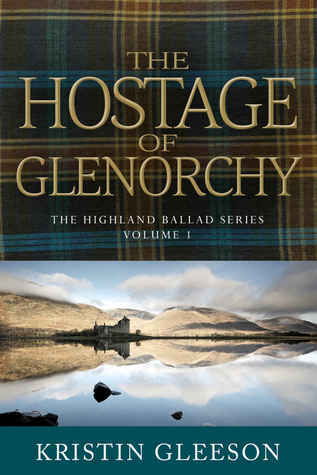 The Hostage of Glenorchy was exciting especially after the midpoint. I didn’t like how it finished not knowing if the two loves would be reunited... Well written and I liked the characters. Enjoyed the tale, but the story leaves you hanging. I guess there is no other option but to continue on to book two in the series. I hope it's worth the pursuits. Will keep you posted. Great story! Abby is a wily young lady and its good that she is considering some of the situations and people she encounters. Highly recommend this book. The plot to kill the queen is just a sidelight - very light. This book was ok. It had some interesting political information, and the characters were fairly well developed. Entertaining book - enjoyed enough to read the next 2. Loved the characters. Originally from Philadelphia, Kristin Gleeson lives in Ireland, in the West Cork Gaeltacht, where she teaches art classes, plays harp, sings in an Irish choir and runs two book clubs for the village library. She holds a Masters in Library Science and a Ph.D. in history, and for a time was an administrator of a national denominational archives, library and museum in America. Later, she served as a Originally from Philadelphia, Kristin Gleeson lives in Ireland, in the West Cork Gaeltacht, where she teaches art classes, plays harp, sings in an Irish choir and runs two book clubs for the village library. She holds a Masters in Library Science and a Ph.D. in history, and for a time was an administrator of a national denominational archives, library and museum in America. Later, she served as a public librarian in America and in Ireland. She has also published short stories and historical essays. Her essay, ‘Blazing Her Own Trail: Anahareo’s Rejection of Euro-Canadian Stereotypes’ was published in, Recollecting: Lives of Aboriginal Women of the Canadian Northwest and Borderlands edited by Sarah Carter and Patricia McCormack, Athabasca University Press, which has been awared the Canadian Historical Association prize for Canadian Aboriginal History.